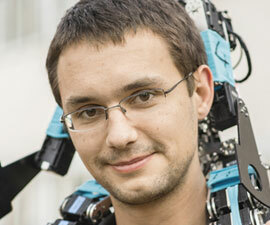 Since 2010 Lutz Freitag researches on robots with the focus on signal processing, perception and motion planning. He started studying computer science in 2007 at Freie Universität Berlin, worked from 2009 till 2013 at Hella Aglaia GmbH in tooling and R&D. Currently he works for Autonomos GmbH and Hanson Robotics in their respective R&D departemts. Lutz participated in the RoboCup with the FUmanoids in the KidSize league where humanoid robots play football autonomosly. Currently he develops software to give robots a sense of their bodies to create smarter and more natural moving machines. When he is not playing/working with robots he enjoys reading, cycling, parks and most of all: traveling.